This post contains affiliate links. I just used a clipart template I found online and put it into Photoshop Elements and filled in the rest. We had 14 8 year old girls (and one 6 year old McKenna and one 2 year old Brinley. Brayden played photographer for the party) and the party was two hours. We could have been longer–we didn’t have time for most of the things I had planned. As the girls arrived, they played in our backyard. I really think we could have had a party where they just played in the backyard! They were loving it and had a lot of fun just playing with each other. You can see here some of how we decorated. I bought a bunch of those $1 table clothes at Walmart. 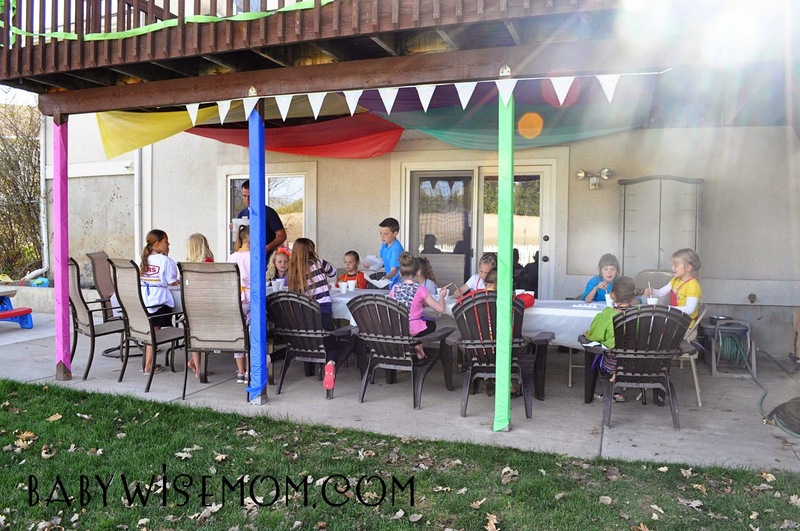 We wrapped the poles of our deck with them and also lined the underside of the deck so it was colorful (the wind blew really hard and pulled some of the corners loose before the party started). I also had a bunting banner (the pattern is on the opposite side of what you can see) I got at Walmart for $1. I didn’t realize how short it was. I don’t think a child cared. Our first activity was painting. I bought some canvas panels off of Amazon. I also got acrylic paints from Amazon–these were fabulous but for the number of girls I had, I would have done better with two sets of these paints. We put the paint into Paint Tray Palettes and spread them out for the girls to share. I had purchased a paint brush set that came in various sizes, but most girls wanted smaller brushes, so I also ended up using these paint brushes that I already had. We also gave each girl a cup of water and a paper towel. 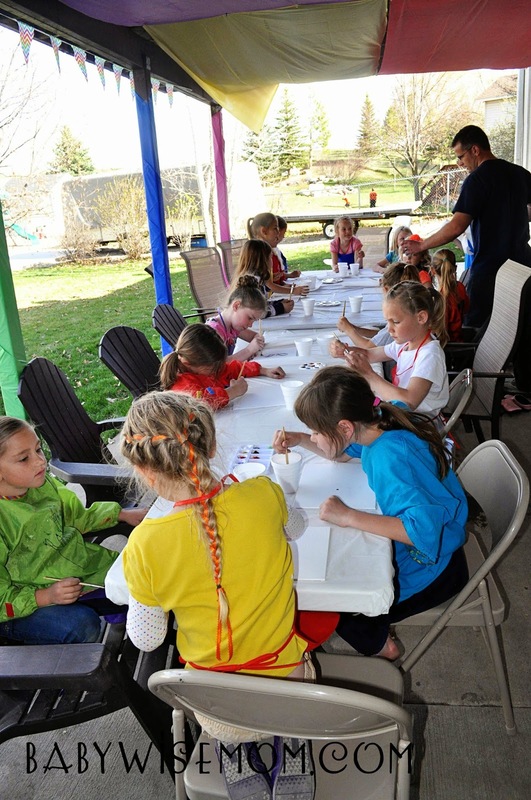 We had paint shirts or they could just use these Artists Aprons I got from Amazon and sent home with each girl (they are okay–they would be better for 4-5 year olds size wise, but they worked). These girls painted for an hour. An HOUR! I think painting on a canvas just made it so they loved it. I have no doubt if I had done paper it would have been a much faster activity. Some girls were faster than that. If they finished early, they just played while the other girls finished up. Our next activity was to quickly eat some dinner of pizza, oranges, and carrots. We hadn’t originally planned on a meal, but Kaitlyn’ soccer game got moved two days before the party to the exact time of her party, so we had to move it back, which put it over dinner time. After dinner, we did a cupcake decorating activity. They really loved this. I gave each girl a cupcake and had an assortment of sprinkles, sparkles, flowers, beads, etc. 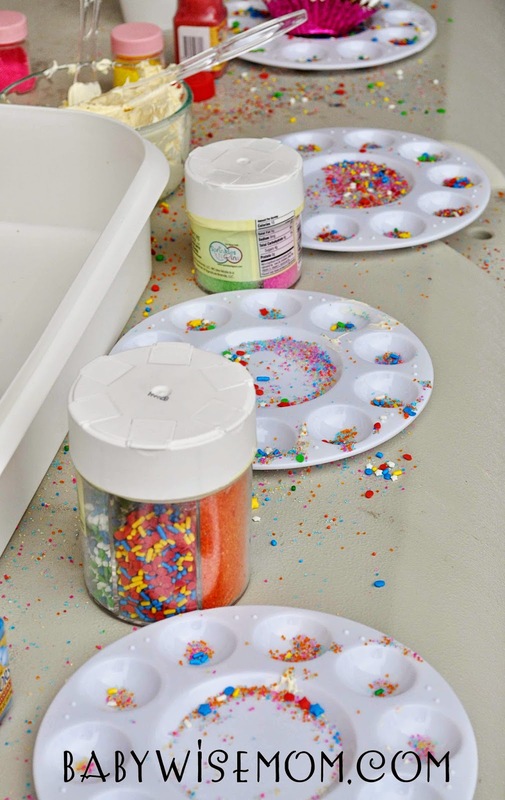 for them to use to decorate. I let them apply their own frosting, as well, which they totally loved and it of course saved me some serious prep time! This took a long time, and the girls really got into making their cupcakes fancy. I was so glad the weather was nice so we could have this party outside. The paint and the cupcake thing were both very messy and could have been a sad thing in the house. As girls finished up, they rushed out to play while the others finished eating. After cupcakes were consumed, we opened presents. And that was it! Time was up and parents came. I will share my other ideas, though. 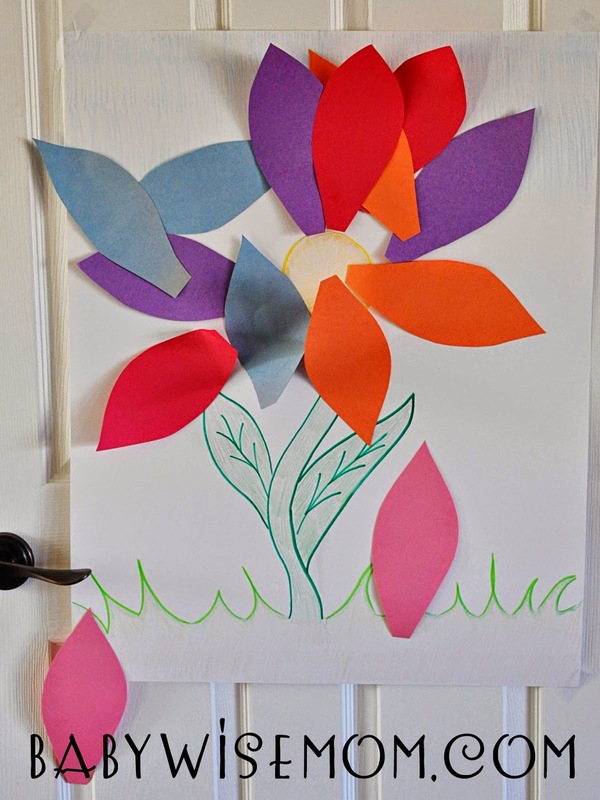 We had prepped things to play Pin the Petal on the Flower. It is an idea I came up with to have a cooperative pin game since the party was about art and creating things. We played it as a family the next day at Kaitlyn’s family party. I also had planned to play color tag. To play color tag, one person is it. Everyone else lines up on one side of the room or yard. The “It” person calls out a color. Everyone wearing that color runs to the other side of the room or yard and tries to not be touched. Anyone tagged joins the “It” person in tagging people. You continue on until no one is left. The last person tagged gets to be “It” next. I also had things prepped to play pictionary. We played this at Kaitlyn’s party last year and the girls loved it. For the words to draw, I had just chosen art words and words that are related to things Kaitlyn loves. Finally, I had planned to play sculpturades. This is where you have play dough and sculpt the word instead of drawing it. I bought some new dough so it would be fresh and easy to use. The girls went home with their canvas painting and the aprons. 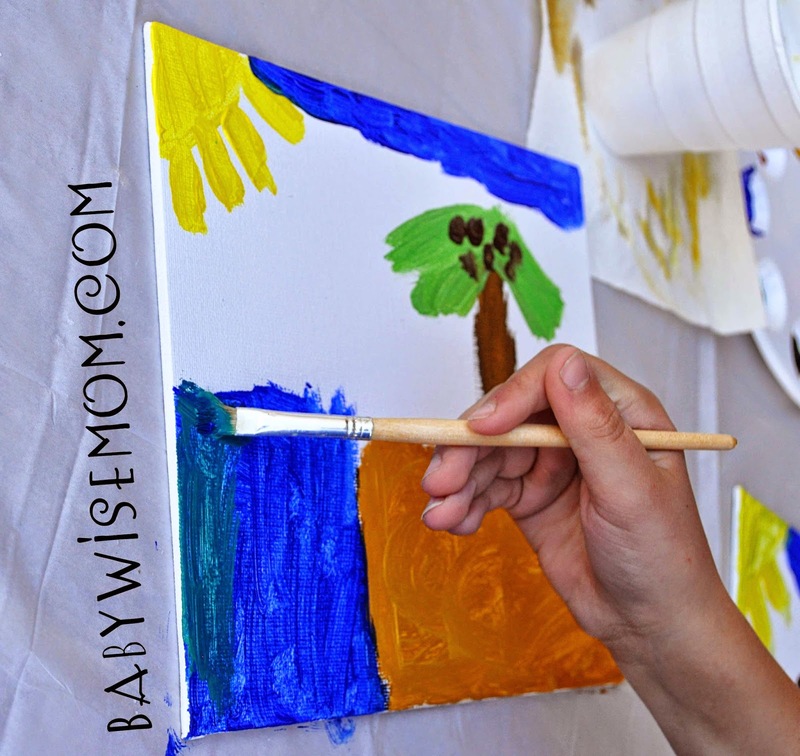 You can find some of these ideas and more art party ideas on my Birthdays and Parties Pinterest board. Awesome party theme!! These kinds of parties are enjoyable and educative at the same time. Kids will get to learn so many things. 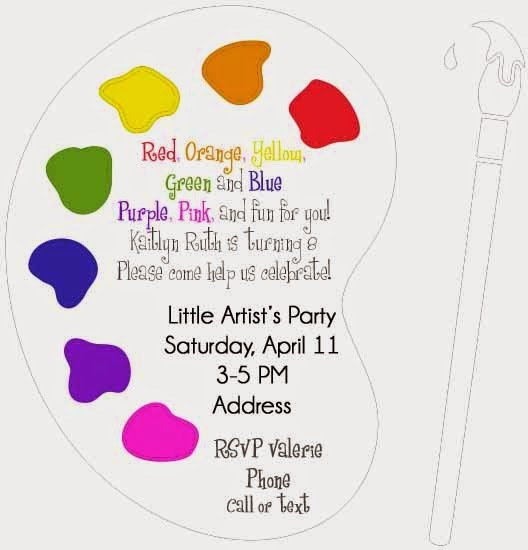 For my kid’s birthday party I always prefer reserving party venues Houston TX but this year I would like to host the artist party at my home.